The third film from stop-motion animation studio Laika, The Boxtrolls continues to show the high quality and uniqueness of their medium. Based on the book Here Be Monsters, the film takes place in a purely fantasy setting, and is packed with as much originality and detail as the studio’s previous efforts Coraline or Paranorman. The studio continues its tradition of bringing us slightly creepy tales of young loners. 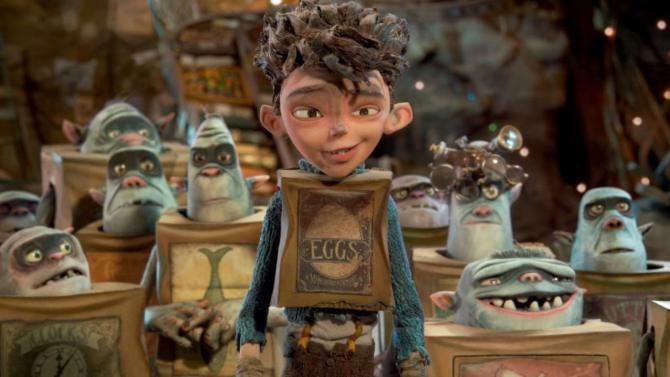 At the center of the film is Eggs (Isaac Hampstead-Wright), a young orphan raised by the Boxtrolls. Their numbers diminish as Eggs grows up, falling to the wrath of Archibald Snatcher (Ben Kinglsey) and his goons. Eggs’ life is changed when he meets Winnie (Elle Fanning), the bratty dragster of the local leader and he sets off to discover his true origins. Overall, the story feels very Roald Dahl inspired, especially in the relationships between the adults and children. Here, the children are the innocent holders of wisdom, while the adults are caught up in their petty cheese mongering and social strata games. Sure, the characters are rendered as over the top in both traits and design, but the uniquely defined quirks keep them from feeling like stock characters. While Eggs and Winnie are drawn a bit broadly, the characters that shine are the villains. Snatcher, while seemingly one note, has some important moments that show his character as a depiction of how ugly people become in their quest to climb the social ladder. It’s a great arc for a villain, and one that we don’t often get to see presented in such cartoonish glory. My favorite characters in the film are definitely Snatcher’s accomplices, Mr. Trout (Nick Frost), Mr. Pickles (Richard Ayoade), and Mr. Gristle (Tracy Morgan). Two of them wrestle with identity issues throughout the film, and the third is just unhinged. 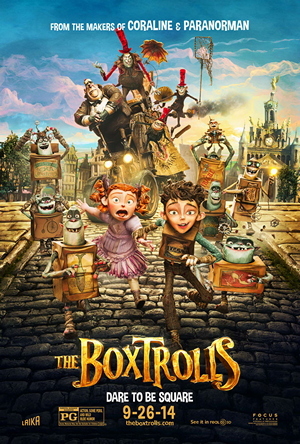 The Boxtrolls is a charming and well-conceived film. While it tells a broad and familiar story, it does so with enough interesting wrinkles to be both very entertaining and engaging, offering a lot for both adults and children. The Boxtrolls opens today in Philly area theaters.